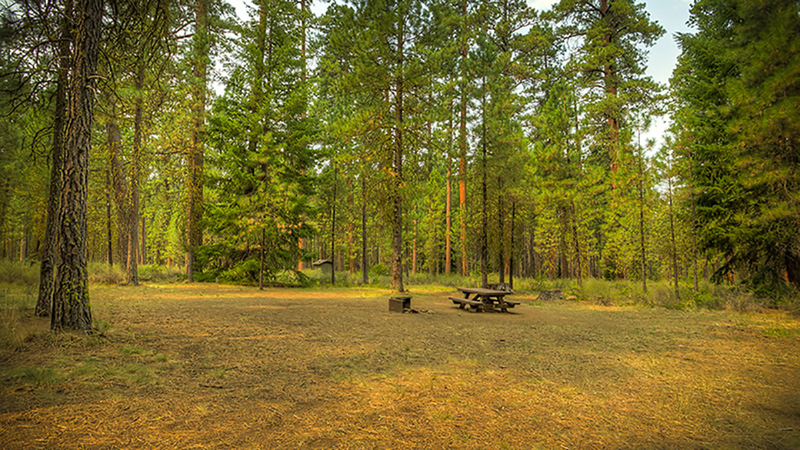 Riverside Campground is one of many along the picturesque Metolius River but it holds the distinction of being more remote and less developed than others. For those campers looking to get away from campground noise and bustle and enjoy nature at its unspoiled finest, this is the place to do it. Settled 14 miles northwest of Sisters and upstream from other Metolius campgrounds and the town of Camp Sherman, you are not far from a couple well-loved points of interest. Camp Sherman Store is just down the road, offering camping and fishing supplies, a limited selection of clothing, and a snack bar serving hot food and espresso drinks. The Head of the Metolius is also close by, and a short stroll down a scenic paved path will lead you to the point where the Metolius originates, bubbling up from the earth and spilling its way downstream. Riverside Campground is made up of 16 tent sites and campground amenities include vault toilets and a hand pump for water. The per night, per site fee is $14 for the first vehicle and $7 for each additional vehicle. The campground typically operates from early May through early October, weather permitting.